Super easy weeknight meal. Prep + cooktime = about 50 minutes. Both come out of the oven at the same time ! 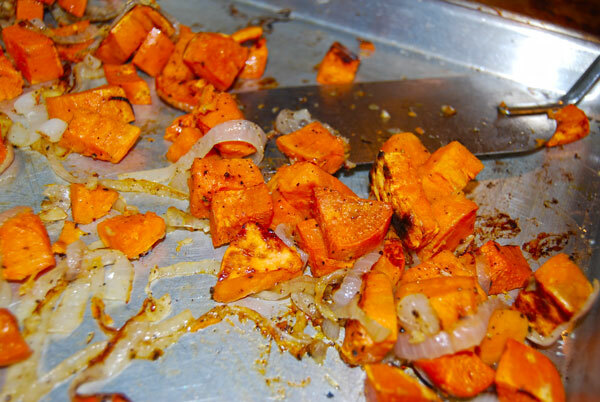 Arrange sweet potato, onion, and garlic in a roasting pan – low edges are preferable. Spray with oil (I use a Misto sprayer), sprinkle with salt and pepper, and mix with your hands to insure all sides of the potatoes/onions are coated. 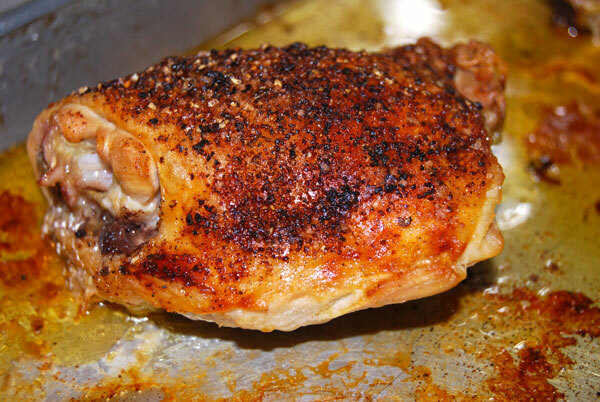 Trim fat from the chiken, remove the skin if desired, and arrange on the roasting pan (skin side up). Again, low edges are preferable. Evenly distribute the melted butter over the 6 pieces. Sprinkle with salt, pepper, garlic powder and paprika. Cook at 375 F for 10 minutes. 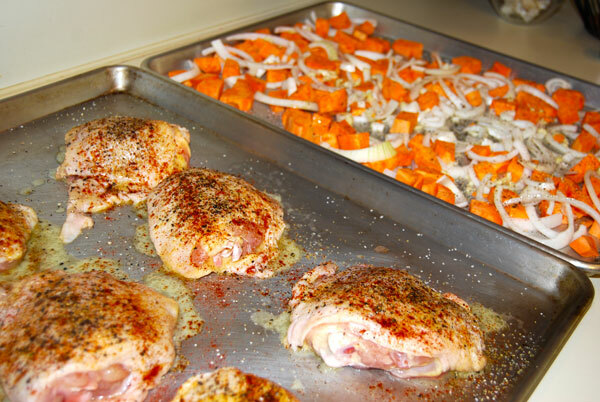 Pop the sweet potatoes in the oven on the bottom rack and continue cooking chicken and taters for 15 minutes. 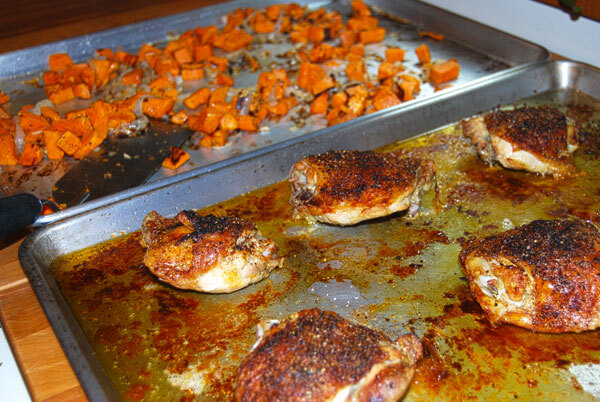 Turn the sweet potatoes with a spatuala, and continue cooking chicken and taters for another 15 minutes. 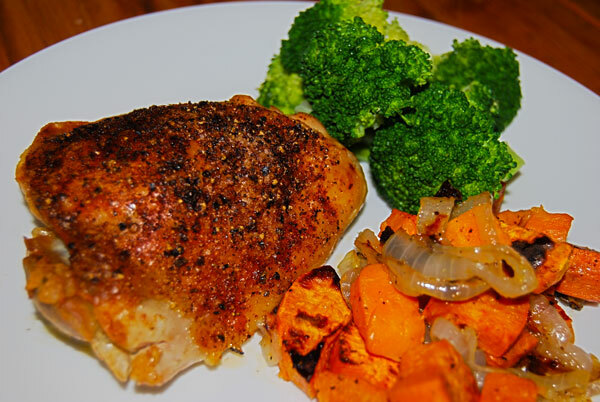 Total cook time is 40 minutes for the chicken and 30 for the sweet potatoes. Great blog you have some real nice looking dishes. Thanks for liking my cooking for kids post, as you can see I’m new to blogging so a real buzz when someone has a read. Like yourself I have found that involving my daughter in the prep heavily influences her ability to try new things and expand her horizons on the food tasting front. Keep up the good work with your kiddo, it pays off ! Thanks so much Elaine !